In the previous post we finished building a thin but functional SOA web service. Now it’s time to test it. We could build just any type of consumer that’s capable of issuing HTTP requests to a service but we’ll stick to a simple Console app. The goal is to test the SOA service and not to win the next CSS contest. Note that we dropped the correlation ID property from the purchase request. It’s irrelevant for the actual user and is set within the Purchase.Post() action anyway before the purchase request is passed to the Service layer. We send a HTTP request to the service and read off the response. We use Json.NET to serialise and deserialise the objects. We set the HttpClient timeout to 10 minutes to make sure we don’t get any timeout exceptions as we are testing the SOA application. Recall that we inserted a product with that ID in the in-memory database in the post discussing the repository layer. Set two breakpoints in the SOA app: one within the ReservationController constructor and another within the ReservationController.Post method. Start the console application. You should see that the code execution stops within the controller constructor. Check the status of the incoming productService parameter. It is not null so StructureMap correctly resolved this dependency. The next stop is at the second breakpoint. Check the status of the reserveProductRequest parameter. It is not null and has been correctly populated by Web API and the Json serialiser. From this point on I encourage you to step through the execution by pressing F11 to see how each method is called. At the end the product should be reserved and a product reservation message will be sent back to the client. Back in the client the ProductReservationResponse object is populated by Json.NET based on the string contents from the web service. The results are then printed on the console window. You’ll get the correct error messages in all three cases. I realise that this is almost identical to PurchaseProduct and a single method probably would have sufficed – you can do this improvement as homework. So we purchase the reserved product immediately after receiving the reservation response. Run the tester object without any break points. You should see the purchase ID in the console window. You will get the correct exception messages in all cases from the SOA app. That’s all folks about SOA basics in this series. I hope you have learned a lot of new concepts. In the previous post we got as far as creating a service layer. Now it’s time to build a client proxy on that, i.e. a layer that the external clients of the service can send their requests to. We’ll use the the Web API technology to build this layer. If you’ve read through the other software architecture series on this blog you’ll see that Web API is very dear to me as it’s very simple to set up and use. Add a new MVC4 web application called SoaIntroNet.WebProxy to the solution. 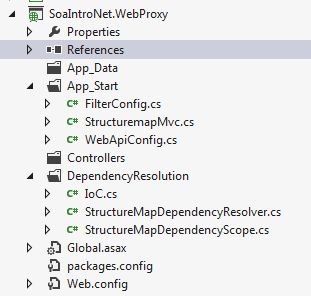 Make sure to select the Web API template in the MVC4 Project Template window. Add a reference to all other layers – this is necessary for the StructureMap IoC container as we’ll see in a bit. Set the namespace of both classes to SoaIntroNet.WebProxy so that they are available from everywhere in the Web project without having to set using statements. If you are familiar with the SOLID principles then you’ll understand why it’s important to inject an abstract dependency through the constructor this way. If not, then start here. The only major difference between the the two Post method structures is that here we set the correlation ID ourselves. It is set to the reservation ID which is unique and it makes sense to use as the message correlation ID to check if we have fulfilled the request. Otherwise the client could provide just any correlation ID so we cannot trust that input. We tell IoC where to look for concrete implementations and which concrete types to take in those cases where the standard ‘I’ naming convention doesn’t apply: (I)Service => Service. For more details consult the post I hinted at in the beginning of this post. This actually completes the client proxy layer. In the next post we’ll test the proxy by building a console application client. Now that we’re done with the domain and repository layers it’s time to build the service layer. If you are not familiar with the purposes of the service layer then make sure to read this post. I’ll employ the same Request-Response pattern here. The only somewhat unexpected property is the correlation id. Recall its purpose from the opening post in this series: ensure that a state-changing operation is not carried out more than once, e.g. purchasing the same tickets twice. As the names imply we’ll throw these exception if some requested resource could not be located or that the required amount in the request could not be fulfilled. This represents our service contract. We state that our service will be able to handle product purchases and reservations and they need the necessary Request objects in order to fulfil their functions. The concrete implementation – which we’ll look at in a bit – is an unimportant implementation detail from the client’s point of view. However, before we do that we’ll need to revisit the repository layer and make room for saving and retrieving the messaging history based on the correlation ID. These messages are not part of our domain so we won’t bother with setting up a separate Message object. The purpose of IsUniqueRequest is to show whether the message with that correlation ID has been saved before. You can probably guess the purpose of the other two methods. We store the responses in a Dictionary. In a real case scenario we can store these in any type of storage mechanism: a database, a web service, cache, you name it. An in-memory solution is the easiest in this case. A side note: it’s not necessary to go with the lazy singleton pattern for all repositories. However, in this example the pattern will make sure that a single object is created every time one is required and the in-memory objects won’t be re-instantiated. We don’t want to lose the Dictionary object every time somebody sends a new purchase request. In the series on DDD, especially in this post and the one after that, I show how it suffices to lazily instantiate a Unit of Work instead of all implemented repositories. The ProductService will need some help from the Repository layer to complete these tasks. It will need a product repository and a message repository. These objects are created by our lazy singleton factories. We know from the discussion on SOLID and especially the Dependency inversion principle that an object – in this case the ProductService – should not create its own dependencies. Instead, the caller should inject the proper dependencies. We let the factories be injected through the constructor. This follows the good habit of programming against abstractions. We then ask the factories to create the repositories for us – note that they are abstractions as well. However, for the reasons outlined above we go with the factory solution in this demo. If we followed this simplified version then our in-memory data would be re-instantiated after every subsequent request making a demo meaningless. We’ll see in the next post how the reserve ticket and purchase ticket methods are implemented. In the previous post we built the thin domain layer of the model application. Now it’s time to build the repository. This is a very simplified repository interface but it suffices for our demo purposes. In case you’re wondering what the purpose of this interface is and what it is doing in the domain layer then make sure to at least skim through the series on Domain-Driven-Design here. Alternatively you can go through the solution structure of the series about the cryptography project starting here. This latter project follows a simplified repository pattern that we’ll employ here. The repository will be a simple in-memory repository so that we don’t need to spend our time on installing external storage mechanisms. If you don’t understand what this means then make sure to check out the post on the singleton pattern. It ensures that we always return the same instance of the concrete repository. We have 2 products with a couple of product purchases and reservations in our data store. The lazy singleton implementation will make sure that the initialisation code only runs once so we’ll have access to the initial set of data every time we need a concrete repository. In the Save method we want to concentrate on updating the product reservations and purchases and ignore the changes in the Product domain itself. Updating product reservations and purchases line by line is a cumbersome task. It’s easier to remove all existing purchases and reservations first and insert the old ones along with the new ones. 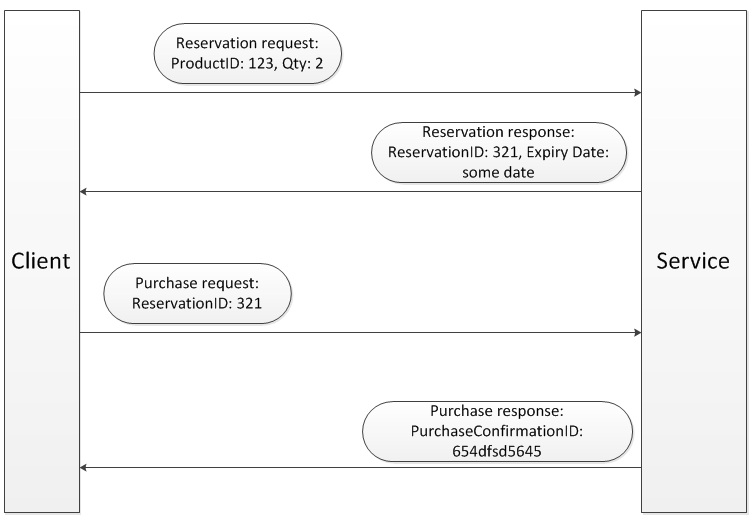 The existing product purchases and reservations are always populated correctly in the InitialiseDatabase() method. Therefore a call to FindBy will product a product with the existing purchases and reservations. So we now have the Domain and the Repository layer ready – we’ll build the service layer in the next solution. The SOA model application will simulate a Product purchase system. The Product must be reserved first and the purchase must be then confirmed. So this is a scenario familiar from e-commerce sites, although in reality the flow may be more complicated. The point here is that the purchase is not a one-step process and the web service must be able to track the registration somehow. So the Product can be anything you can think of: tickets, books, whatever, that’s a detail we don’t care about. We’ll continue from the previous post which set the theoretical basis for the model we’re about to build. If you have followed along the series on DDD then you’ll notice that the Domain structure I’m going to present is a lot simpler: there’s no aggregate root and entity base etc., and that’s for a good reason. Those belong to the DDD-specific discussion whereas here we want to concentrate on SOA. Therefore I decided to remove those elements that might distract us from the main path and keep the Domain layer simple. Otherwise if you are not familiar with DDD but still want to learn about SOA you may find the code hard to follow. Open Visual Studio and insert a new blank solution called SoaIntroNet. Add a C# class library called SoaIntroNet.Domain to it and remove Class1.cs. Add a folder called ProductDomain and a class called Product in it. Here’s the Product domain code with some explanation to follow. The code will not compile at first as we need to implement some other objects as well in a bit. We maintain a list of purchased and reserved products in the corresponding List objects. The Allocation property means the initial number of products available for sale. In Available() we check what’s left based on Allocation and the reserved and purchased tickets. Note the expiry date property which fits in well with our discussion in the previous post: the client needs to reserve the product first and then confirm the purchase within the expiry date. That’s all the domain logic we have in the model application. In the next post we’ll implement the repository. SOA – Service Oriented Architecture – is an important buzzword in distributed software architecture. This term has been misused a lot to mean just any kind of API that spits out responses to the incoming requests regardless of the rules and patterns common to SOA applications. We looked at the role of the Service layer in this post and the one after that. In short a service represents the connecting tissue between the back-end layers – typically the domain logic, infrastructure and repository – and the ultimate consumer of the application: an MVC controller, a Console app, a Web Forms aspx page etc., so any caller that is interested in the operation your system can provide. To avoid the situation where your callers have to dig around in your backend code to find the operations relevant to them you can put up a service which encapsulates the possible operations to the clients. Such a service – an application service – is usually void of any business logic and performs co-ordination tasks. The target audience is developers getting started with SOA. The sample application will follow a layered structure similar to this application although in a simplified form. I won’t concentrate on the Domain as much as in that project. We’ll put most of our focus on service-related issues instead. However, I encourage you to at least skim through that series on Domain Driven Design to get an understanding of layered projects in .NET. SOA is quite generic and can be applied in several different ways depending on the starting point of the – often legacy – application you’re trying to transform. There are however a couple of rules and practices to keep in mind when building a SOA app. Boundaries are explicit: a service interface needs to be clean and simple. Note the term ‘interface’: it is what the clients see from the outside that must be clear and concise. Your code in the background can be as complex as you wish, but your clients should not be aware of it. Services are autonomous: service methods should be independent. The caller should not have to call certain methods in some order to achieve a goal. You should strive to let the client get the relevant response in one atomic operation. Service methods should be stateless: the client calls a service and “that’s the end of the story”, meaning there shouldn’t be any part of the system left in a partially done state. Interoperability: a service should only expose an interface, not an entire implementation. Communication should happen with standard message types such as JSON or XML for complex objects or simple inputs like integers and strings for primitive inputs so that clients of very disparate types can reach your services. Policy exposure: a service interface should be well documented for clients so that they know what operations are supported, how they can be called and what type of response they can expect. We discussed the Facade design pattern in this post. In short it helps to hide a complex backend system in form of a simplified, clear and concise interface. The main goal of this pattern is that your clients shouldn’t be concerned with a complex API. We discussed the RequestReponse pattern in this post. In short the main purpose of this pattern is to simplify the communication by encapsulating all the necessary parameters to perform a job in a single object. Make sure to read the referenced post as we’ll see this pattern a lot in the model application. It would be difficult to put all these steps into a single interface method, such as ReserveAndBuyGoodsAndConfirmAddress(params). Instead, a reservation ID is provided when the items are reserved in the shopping cart. The reservation ID can be used in all subsequent messages to complete the purchase. Typically an expiration date is attached to the reservation ID so that the purchase must be completed within a specified time range otherwise your reservation is lost. This is very often applied when buying tickets to the concert of a popular band: you must complete the purchase within some minutes otherwise the tickets you’ve requested will be put up for sale again. The client, very likely a web interface sends a reservation request to the service. This request includes the product ID and the quantity. The reservation response includes a reservation ID and en expiry date. The reservation must be completed with a purchase until that date. The client then asks for payment and delivery details – not shown in the flow chart, this happens within the client. When all the details are known then the purchase order is sent to the service with the reservation ID. The service checks the validity of the reservation ID and rejects the call if necessary. If it’s validated then a confirmation ID is sent by the service. An operation is idempotent in case it has no additional effects if it is called more than once with the same parameters. You cannot control how your public API is called by your clients so you should make sure it does not lead to any undesired effects if they repeat their calls over and over again. A common solution is to provide a correlation ID to any potentially state-altering operations. The service checks in some repository whether the request has been processed. If yes then the previously stored response should be provided. The client sends a request to the API along with a unique correlation ID. 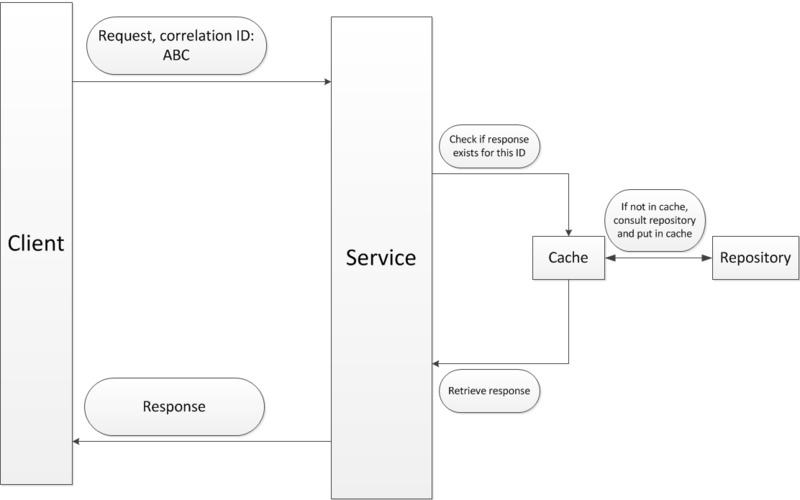 The service checks in its cache whether it has already processed the request. If yes, then it sends the same answer as before other it asks the backend logic to perform some action and then put the response into the cache. Most often the communication with a web service is such that you send a HTTP, TCP etc. message to it and receive some type of acknowledgement. This kind of message exchange pattern (MEP) is well represented with the RequestResponse pattern mentioned above. You send off the payload in the query string or the HTTP message body and receive at least an “OK” or “Error” back. The service then “let’s you go”, i.e. it won’t just remember your previous request, you’ll need to send a reference to any previous communication, if it’s available. We discussed the service contracts above. These are the interfaces of the service which the caller can call upon without worrying about the exact implementation details. In a Duplex scenario we have another contract, namely the Callback contract. The caller sends a one-way request – i.e. a request with no immediate response whatsoever – to the service and the service responds back after some time using the callback contract. The service needs a channel to the client which is problematic for security reasons. It might not even be possible to keep the channel open due to firewalls and Network Address Translation problems. The long running process updates the state of the job in some repository periodically: started, ongoing, about to finish, finished, exited with error, etc. In the next post we’ll start building the model application using these patterns – with the exception of the Duplex MEP as it’s too complex and rarely used nowadays.